Caterham initially arrived in Formula One bearing the Lotus brand, but soon switched to another road car moniker. They were the best of the 2010 “new teams” for several seasons, but lost out on tenth place in the championship to rivals Marussia in 2013. They dropped further back when Marussia scored their first points in 2014, but both teams succumbed to financial pressures, and went into administration before the end of the season. Caterham F1 entered the sport in 2010, racing under an entirely different name. The company behind the squad is called 1Malaysia Racing Team, made up of a group of entrepreneurs from Malaysia. When they appeared in the paddock for their debut season, they were running the Lotus brand – a marque made famous by Colin Chapman in the 1970s. At the helm, Tony Fernandes guided the team through their first season in F1, a season without any major results, where getting to the end of each race was an achievement in itself. They didn’t score any points, but finished tenth in the championship, ahead of two of the other new teams that entered in the 2010 season. Mike Gascoyne was in charge of the technical development of the car, and a late start in 2010 hindered the performance, but for 2011, they managed to improve a little and bolster the engineering department. They also confirmed a move from Cosworth to Renault engines, with a two-year deal, as well as a change of name. 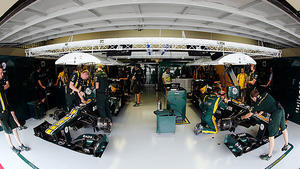 Initially known as Lotus Racing, 2011 saw the team move to call themselves Team Lotus. This caused a long-running licence dispute with Group Lotus to escalate, and the 2011 season saw two teams with the Lotus brand – Team Lotus and Lotus Renault. After visits to the High Court, both sides of the argument claimed to have won, but the results was moot anyway. Tony Fernandes bought Caterham Cars and rebranded the F1 team with the new company logo and colours. Caterham F1 made their debut in 2012, but the results continued as before – the team finished three seasons in a row in tenth place in the championship, but never scoring a point or making much impact on the midfield teams in front. 2013 was similar, although Caterham lost out on tenth place to their backmarker rivals Marussia, by dint of non-points finishing positions. During the season, they did secure their best ever grid slot, with Giedo van der Garde lining up 14th in Belgium. Going into the 2014 season, the team opted to ditch both their drivers and run an all new line-up of rookie Marcus Ericsson and the returning Kamui Kobayashi. Ahead of the season, boss Tony Fernandes issued a threat to the team that if they couldn’t bring home better results, he would be likely to call it a day and withdraw from F1. The team did score a highlight 11th place in Monaco, but still found themselves behind rivals Marussia who picked up their first points at that same race. An overhaul took place midway through the season, with new owners coming on board, and Christijan Albers taking over as team principal. That didn't last long however, and a subsequent reshuffle failed to pick up the team's fortunes. By the end of the season, Caterham had gone into administration. They expected to miss the last three races of the year, but a crowdfunding campaign allowed them to return for the final round in Abu Dhabi. 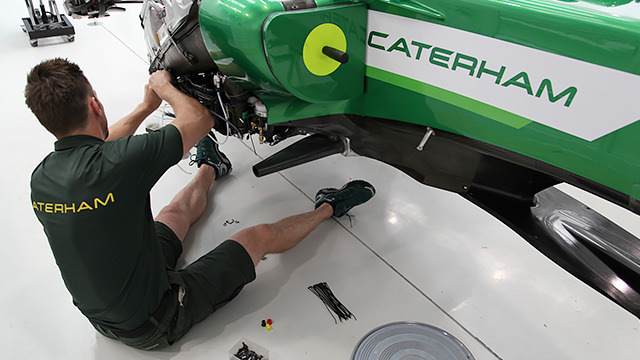 Learn more about Caterham with the Pocket F1 Handbook. Marcus Ericsson failed to participate in qualifying after the mechanics desperately tried to patch up some hydraulic issues but missed the cut. Their hopes were raised when Hamilton brought out the red flag, granting them some extra time, but still it wasn't quite enough to get Marcus out on track.Nevertheless, the FIA have given special dispensation for the Caterham driver to race:"The Stewards have received a request from Caterham F1 Team to allow car 9 to start the race despite not setting a time in qualifying. in accordance with Article 36.1 of the Formula One Sporting Regulations, the Stewards grant permission for car 9 Marcus Ericson to start the race, as the driver has set satisfactory times in practice at this event." However, the engine manufacturer have also revealed that some of the teams are late in paying for their power unit supply and that is having an effect on their own ability to develop and gather resources. Without pinpointing a particular team, Renault's F1 president Jean-Michel Jalinier said: "It is a serious concern. We can live with it up to a certain point, because we are developing, putting money in the business, and we need to get our resources. "Four teams are currently supplied by Renault - defending champions Red Bull and their sister team Toro Rosso, former Renault works team Lotus, and former Renault road car partners Caterham.